Our DONJOY Performance Trizone Knee Sleeve is a hybrid design combining the properties of compression and bracing in a single sleeve. 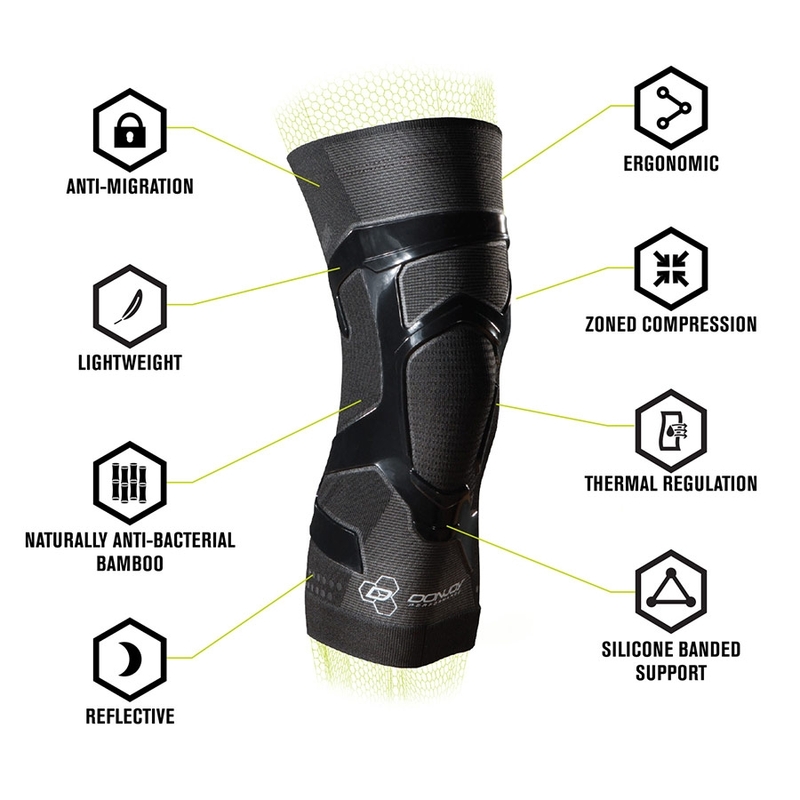 The carbonized bamboo circular knit construction allows for targeted, zonal compression around the knee joint. Three distinct compression zones which include: a stability zone with strategically placed injected silicone to provide support for the knee joint and the benefit of enhanced proprioception, a compression zone which improves circulation and provides mild support to the joint structure and surrounding muscle tissue, and a comfort zone that provides lighter compression for enhanced fit and better range of motion. The Trizone knee support is a low profile performance product designed to keep you moving and supported. I have Osgood in my right knee and I quite not sure what brace to get. I've had it for years now and a neoprene sleeve doesn't work. What would you recommend? The DonJoy Performance Trizone Knee Support Brace would provide compression and mild support, also the DonJoy Performance Anaform Power Knee Sleeves, https://www.betterbraces.com/donjoy-performance-anaform-power-knee-sleeve are ideal for lifting, providing squat rebound for enhanced performance. MyFor the tri-zone knee support brace, my thigh shows a XS but my knee and calf show a S. Which do I get? Please give us a call at 800-553-6019 with your exact measurements so that we're able to make a suggestion for you. The fit is mostly dependent on the thigh measurement. Is the tri zone brace washable? You can handwash and air dry the Trizone with mild detergent. I have OA in left knee and am trying to decide between the trizone knee sleeve and the performance trizone knee sleeve. Advice? I also have a size question. Thigh is 20", both knee and calf are 16" so not sure about M or L size. Both offer compression to deliver a customized fit and target knee pain relief. The DonJoy Trizone is a little bit longer than the DoNJoy Performance Trizone is. In the DonJoy Trizone you would be a size medium, and in the DoNJoy Performance Trizone you would be a size large. Also, you could take a look at the DonJoy OA Reaction Web Knee, as this is specific to OA. I took shrapnel through my knee back in 05, it missed the major ligaments but tore up my miniscus. I have patella femoral and iliotibial with my miniscus kinda flapping in the breeze on the inside side of the joint sometimes getting caught and locking my knee or making it give out. The VA has been getting me the kneedit strap, and it works ok but it wears out quickly and it doesn't stay in place very well. I stay pretty active so I need something that's going to hold up and stay put and give me everything I need without causing more pain like some of the hinged braces can. Is this a good option for me? Unfortunately I wouldn't recommend the Donjoy Performance Trizone Knee support for your current diagnosis. You will need more support since it is just a sleeve. The one I would recommend is the OA REACTION WEB KNEE BRACE with a medial unloading hinge. It is lightweight, low profile and it will shift the pain away from the inside of the knee while you are doing your activities. As far as staying put, you will need to measure your knee standing up, shoulder width apart, legs slightly bent and muscles contracted. You will need the circumference your knee center, thigh (6" above from the knee center) and the calf (6" below from the knee center). I fell from a decent height about a year ago straight down on my feet. I now have some problem patellar tracking in one knee. I have used other braces, but I have found that the basic compression braces tend to move around, and pull my knee cap lower, while the velcro-fastened braces work much better until the velcro wears out. What would you recommend? I dislocated my patella a over a year ago, I have had no further dislocations, however I am still suffering from pain. Will this provide adequate support or should I look at a patella stabilizer? The DonJoy Performance Trizone Knee Support will provide you with some compression while doing activities. You may want to look at either of these, depending on your level of activity. How long does the product last if I use it for 1-2 hr day, 7 days week and wash it once a week? The DonJoy Performance Trizone Knee Support Brace has a warranty of 6 months. If there happens to be a defect within that time we will be happy to replace the product. I am an active 47 year old. and had repair surgery for medial meniscus tear 10/15 from a fall. I have dealt with pain/swelling medially ever since. I have just been diagnosed with severe narrowing space medially...osteoarthritis. What would be the best brace to relieve the medial pain during walking, hiking and other exercise? The Don Joy Reaction Web Knee May offer you some relief. The Reaction helps by absorbing forces on the knee and dispeasing them away from it. This usually decreases anterior knee pain. The brace is a low profile brace that can be worn durin all activities. I have developed Reiter's syndrome and RA on my left knee and other parts of my body , I'm looking for a product to allow me to use the elliptical,upright bike, the arc trainer or octane trainer , and to have less pain after wo. Does the trizone knee support brace would give me control over pain and motion am looking for ? Thank you. The Trizone Knee Support will provide mild knee support and zoned compresion of the knee. The sleeve will allow complete motion of the knee so using it for those exercises would be no problem and it will help decrease any swelling you may get. Is the price come with a pair? I'm starting the police academy next month and I'm experiencing outside and back of knee pain. We will be doing lots of body weight and running exercises. What would be a good brace? The Tru-Pull Advanced System or the Tru-Pull Lite will help to keep the kneecap in the correct postiion and prevent dislocation. The Tru-Pull Lite is a lower profile version of the advanced system. I bought the Trizone Performance knee sleeve. It feels comfortable but does not feel snug. My measurement put me in Large size category. How snug should it be? I've had ACL surgery. Will this help support on a daily basis? I have a meniscus tear and I'm looking for a brace for backpacking. I will be in New Mexico in July and will wear it eight hours a day in the heat. Will this brace be too hot? I got a compression fracture at the top of my tibia and I do competitve trampoline and my knee hurts in the back evry time i land. would this or any brace help? I have severe arthritis in both knees. I'm looking for a brace to help with everyday activities. I've got two camping trips coming up and would like to keep up with my two granddaughters as much as possible. Do you have a brace that can help me? Take a look at the OA Nano Knee Brace. this brace can offload the arthritic area of your knee to decrease pain. The brace is for moderate OA and is very light weight and low profile. I have chrondromalacia and degeneration in the meniscus. I had arthroscopic surgery 11 yrs ago, but the knee has been getting progressively worse, although I have not had a problem with pain after sitting for a while and then standing from chrondromalacia since the surgery. What type of brace would be best for every day use and for agility? I have moderate OA in both knees with the left being worse than the right. I play roller derby, so when I'm not skating with my legs bent in a permanent squat position, I'm giving and taking hits and falling to the ground. I need something that wil support my knees and absorb some of the shock when I fall that can be worn under my knee pads. Help? The Don Joy Performance Trizine knee sleeve will provide mild support to the knee and comptression but they should fit under a knee pad. Better support for the knee a absorbing the forces on your knees would be the Reaction Web Knee Brace but it is a bit bulkier than the sleeve. If your surgery was recent then the FullForce ligament knee brace would be the best brace for you. If your ACL injury happened years ago then the Playmaker with the fourcepoint hinge would be suitable for you. Rowing is not a sport listed on your sports finder. I am looking for a brace which is not going to chafe the back for my knee and bunch up too much. Suggestions? I have had LCL repair and Biceps femoris repair. Now I have some arthritis in the knee. Will this brace help provide stability and relief while running? I am an Outside Hitter for a high level competitive volleyball program. I have been dealing with chronic Jumper's Knee for the last 8 months. I have sat out of volleyball for 6 weeks while doing PT. I've tried knee straps and KT Tape, to no avail. Do you think the DonJoy Trizone Knee Support Brace will help, or do you recommend another type/style of Brace? Also, is this brace designed to wear under volleyball knee pads? Please help. get back into shape and I have noticed when my right foot gets sore from workouts (regular workouts and Spartan Race training), I overcompensate by putting more pressure on my left side leg which hurts my left knee. What would you suggest to wear on both my right foot and my left knee to levitate the pain so I can workout and do my Spartan Race without worrying about the pain? The Reaction Web Knee Brace would be the best for your knee to help decrease the forces on your knee therfore decreasing knee pain. do I measure sitting down or standing up ? if above the knee is 19.5 knee circumference is 15.5 and calf 15 should I go with a medium or large ? The measruing should be done standing and based on your measurments I would say medium. I have a torn ACL in both my right and left knees and a torn meniscus in my right knee my right knee is pretty loose. I would like to get back to playing sports ie. Wrestling, jujitsu, football, soccer and boxing would any of your braces help during these sports? Hello, I've dislocated both of my knee caps several times. Will this brace help keep them in place? The Trizone knee support will provide compression and mild support for the knee. You will want to look at the Tru-Pull Advanced System knee brace. this brace is our most supportive knee brace for those that have dislocated the kneecap multiple times. the braces design will make sure that the kneecap tracks correctly and stays in place. My son had a patellofemoral fx that cant seem to heal. Injury was 10/14. Plays basketball. What is the best brace? If you want something for OA but smaller you can try the OA Reaction web knee brace. If will offload just like your bigger brace but not as much and the brace itself is a much lower profile brace. I had a patella dislocation which brace would be best for me? I have pain to outer portion of both sides of my knee after 1.5-2 miles into my runs. I am currently doing physical therapy to strengthen my muscles around the joints and tendons. In the meantime I am looking for a brace I can use on my runs that will help support when the pain comes. Would you suggest the trizone brace or another one of your braces? I am currently 2 years out from my second right ACL reconstruction. I am a college field hockey goalie and have worn the don joy defiance brace the past two years. I am looking to move to a lower profile brace next season when I will be 2 years and 9 months out from my surgery. Does this brace provide any acl support and would it be appropriate this far out from my acl surgery? I am one year out of ACL/MCL/meniscus surgery. I am a D1 goalie and play most games on turf. I do not feel comfortable wearing the brace (with hinge) that I have worn for my rehab (with sliding etc.) will this provide support and be safe and provide support during contact? I have severe Patelfemoral Arthrosis/Syndrome. I'm looking for a new knee brace because the previous ones don't fit right (i have big thighs and always get rolling at the top of the brace). My current one is just big and bulky but does the trick because of the Velcro straps. Which knee brace would you recommend based on the information I have provided? I have a partially torn ACL and a issues with my meniscus. I have been fitted for the full hinged brace from the surgeon. What could I buy that would provide compression and light support for the times when the clunky ACL brace is not practical. Also, do you offer anything suitable for swimming? I purchased a knee brace for my friend from you and she seems to love it but its not the same knee brace that Im looking at on here because I have tried hers and it rubs my leg and leaves a sore. So I thought I would go for this type and see IF it stays up on my thigh? I have no prior serious knee injuries or surgeries, but have recently been experiencing some instability in ny right knee while skiing. I'm looking for something that will provide some extra stability, maximize range of motion, and not get caught up in clothing/gear. Suggestions? Something without hinges will only provide compression and very mild support. I am a 44 yr old very athletic woman looking to continue to workout to stay fit using bicycle, elliptical, lifting weights and some team sports. I had a PCL replacement 10 years ago and am already in need of a knee replacement due to no cartilage, severe arthritis and bone spurs all over my knee. I'm looking for something lightweight for support and to help with pain while working out. Can you suggest something? The Reaction Web Knee Brace is a light weight brace that offers mild support to the knee and reduces anterior knee pain. I have recently had surgery to repair a tibial plateau fracture, and am planning a through hike on the Appalachian trail. My concerns are obviously support for the afflicted area, but also weight, as I will be using this product for 5 months. What would be the best option for my knee. The Deluxe Hinged Knee support would be the best choice for supporting your knee while hiking. I have a completely torn ACL on my right knee that happened about 6 mos ago. I have opted out of surgery for now, since I have minimal pain and I have been fully functional on my knee. I crossfit 4-5 times a week and for the most part I don't have any restrictions with my workouts because of my knee. I have worked on leg strength and started PT to continue to make sure the knee stays strong to keep it stable . I am occasionally sore on inside of knee and sometimes outside of it. I am looking for something that will help support my other ligaments since I don't have the ACL. I prefer not use a brace with hinges or one that would be too bulky. I currently use a knee sleeve to keep compression on my knee while i work out. Would this TRIZONE KNEE SUPPORT BRACE give me support (along with compression) on the sides(inside and outside) of my knee to help keep it stable? I was also looking at the Don Joy performance BIONIC KNEE BRACE. Which do you recommend to be better for my needs? The ACL is the main ligament that keeps you knee stable and someone with out an ACL can get along fine if they are not doing high active cutting activities. Someone who does not have an ACL who wants to perform at a high level in activities such as cutting would knee something to support the beyond strong muscles such as a rigid functional knee brace. The Trizone will provide compression only no stability at all and the Bionic Knee brace will provide medial/lateral support and compression but no support for the ACL. I'm looking for a brace to wear since having my ACL replaced (with my hamstring tissue) and a partial meniscectomy on same knee. I have worn the tru pull lite brace due to a meniscus tear and a partial patella release. Would this brace keep the knee cap tracking correctly like the tru pill lite? I find the tru pull bulky under clothes. I am boarder line XL/L what would you suggest to go larger or smaller? I'm using the water RockTape/KT tape for my knee to stabilize after fully recovering (medial patellofemoral ligament tear), I use it only for performance hiking, running, snowboarding and mostly SURFING with great results. "The Trizone Knee Brace" totes that it "simulates therapeutic taping", does "Trizone Knee Support Brace" as well? I'm confused...You mentioned the only difference between the two is in the laying of the silicon, but in another comment below mentioned that it would not replace the taping. Can you help recommend one for me? The Two sleeves will provide the same support and compression. I believe I might have confused KT taping with McConnell Taping. The brace will indeed simulate KT taping, does not substitute McConnell Taping. My son broke his tibia and fibia. Had a rod inserted through his knee so his knee is weak. we are looking for a brace for basketball for extra support. Would this one be good? The Trizone is a sleeve and will provide compression but no real support for the knee joint. I would suggest a hinged knee brace such as the Economy Hinged Knee Brace. 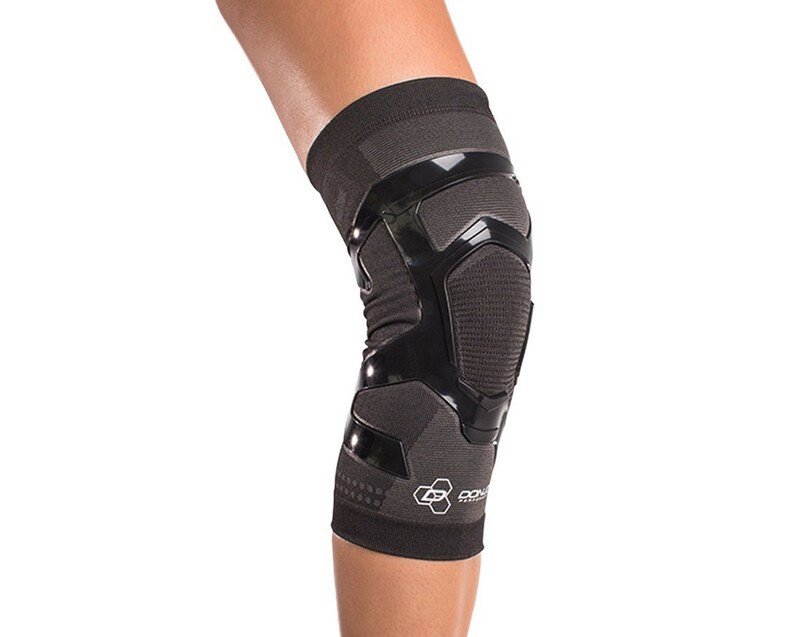 I am looking for a brace for knee support after surgery for a torn meniscus. I still have instability and pain in the knee with some arthritis. I am allergic to neoprene. Which brace would be recommended? Can this sleeve be used together with the Reaction brace to help with chondomalacia of the patella and a torn meniscus? I have severe OA in my right knee. I use a semi-custom unloader brace when playing tennis three times a week. I feel like I could use compression and mild support when while doing everyday activities. Is the Tritone Knee Support brace what I'm looking for? Most likely you son has a bruise from the contact with the helmet, and the Trizone Sleeve offers compression to the knee which should help with any swelling he still may have. I have patellar tendinitis. Will trizone help with the pain I feel after playing Vball, running or after weight training? The Trizone knee sleeve has silicone installed on the outside to help with patello femoral pain associated with patellar tendonitis, so it may help with your pain. can I use the brace for patella instability? Hello, I am an ice hockey goalie returning from my second meniscus surgery. I was wondering if this brace or the other trizone brace would help keep stability in my knee while allowing full range of mkion that I need for the twisting and turning I do whilst playing? Also if the size of my knee says I should order a large but both the below and above knee measurements put me in a medium which size should I order? What is the difference between this DonJoy Performance TriZone Knee Support Brace and the DonJoy TriZone Knee Brace? My knees don't typically cause me problems; however, after running the very hilly Tough Mudder course in Colorado, they hurt quite a bit, particuarly on the IT Band on the outside of my knee. Will this help with that? Also, does this brace not come in an Extra Small size like the regular DonJoy TriZone Knee Brace? What brace would you recommend for someone who has has multiple meniscus surgeries along with a bone graft on the knee due to arthritis. I am on my feet all day and also like to bike and play tennis. I'm a volleyball player. I usually Kinesio tape my knees and wear Reaction Web Knee Braces. Would the Trizone Knee Support Brace replace the need for Kinesio tape? Will this brace work for people who are on there feet 12 to 13 hours constantly bending, twisting and walking around. Can I wear this brace on either knee? i know that you have to order for a certain one but i have knee pains in both knees. These braces have silicone on the sleeves that will match up with each leg so you need to order the correct leg for the braces to be effective. The same sleeve will offer support differently for each leg. Our daughter plays competitive ultimate frisbee. She has a high grade tear of the semi-membranosis tendon at the knee. Would this brace benefit her? If not, can you suggest a brace? What brace do you suggest for an 11 year old male soccer player (5ft1, 105lbs) with some signs of "jumpers knee". The DonJoy Performance Trizone Knee Support Brace will offer great compression to improve circulation and provides mild support to the joint structure and surrounding muscle tissue.It is designed to keep you moving through repetitive motion injuries. Will this brace hold up for wrestling/grappling ?? The DonJoy Performance Trizone Knee Support Brace will be great compression sleeve for wrestling.The anti-migration technology will help the brace stay put and apply compression around the knee joint. Can this brace be worn in water for triathlon swims, surfing, etc? Yes you can wear the DonJoy Performance Trizone Knee Support Brace in the water. We suggest you rinse it with fresh clean water after and let it air dry. Is there any neoprene or polyamide in the material? Background: 5 years post-op ACL reconstruction, still experience pain between knee and upper fibula under heavy activity/exercise. Some medical disagreement over whether I may or may not have re-disrupted the repaired ACL two years ago. Wanted something for a little support just in case, and to try and relieve some of the pain when at the gym, running, and cycling. Fit seemed a tad loose at first, but realized that it really gripped into place well once you started sweating a little. The sleeve itself doesn't provide a ton of support, but does provide something without otherwise restricting your movement like more bulky or reinforced sleeves do. You can pretty much retain full range of motion with the sleeve. Running, biking, leg presses, stretching - all of it can be done without restricting ROM and without any bunching or pinching of the fabric. Since it lacks any heavy padding or reinforcement, it's also quite light, and easy to ignore while you're wearing it. You can feel the support of the silicone bands. And my biggest concern is how they will hold up to wear and tear over time given the screen printing process they used to apply them. I'm not sure if the fabric+band support is necessarily superior to what you might be able to get out of a cheaper, more basic compression type sleeve, so you might consider that if cost is a factor, since this is definitely pricey for a sleeve. The inner "pocket" is useless and is the main reason I don't go 5 stars. Since it's inside and smashed up against the back of your leg, you're not gonna stuff keys or anything in it. It's not even big enough for that, really, nor is it convenient in any way to access. About the only thing you could really stick in it without it being a problem are a couple dollar bills. And even empty, it can bunch up and be annoying. It should have been left off entirely, in my opinion, and I'd cut it out if it weren't for the fact that I suspect the edge left behind would be more annoying than the whole thing just being there. Overall, I do like it, and plan on continuing to wear it throughout my daily gym routine. My hope is that as leg strength improves, and muscle mass increases (I still have a size imbalance from the atrophy after surgery even after all this time), the support provided will improve via better compression. I'm also counting on it not wearing out prematurely, since at this pricepoint, I probably wouldn't rebuy one if that were to happen. Really good for use at gym, sporting events or anything where you're going to be active. Not so great for just normal use. I first ordered the brace made for my right leg, but I need the support on the inside of my knee. So, I ordered the same brace for my left leg and wear it on the right. This works. If you can suggest something better, please do. I use this brace on a knee that has had 2 surgeries - totally torn MCL & Meniscus cartilage. Also, currently have a torn ACL, only a stub left. Brace has really helped the ACL lack of stability in my workouts and simple movements that were difficult --weight bearing on the bended knee, etc. Prior to brace, I had to ice down the knee and had troublesome pain for 24 hrs. The brace has eliminated the need for icing and pain level is down significantly. Pros: THE BRACE WORKS . It provides significant stability while not being as cumbersome as many of the metallic structured braces. Cons: In order to size the brace for thigh and calf size so that the brace does not slip. requires a small size that can be too tight over the knee itself, which is typically swelled beyond normal size due to previous trauma. The Trizone helped offer the compression I needed to support my knee during a week long trade show. Slim and supportive. Cons: Thigh portion needed to be pulled up - but if it were tighter I would be concerned about cutting off circulation. I have OA and am a volleyball player. This brace is very comfortable to wear but does not provide enough compression or support. This must be great for light exercise but not to play volleyball for hours. I went back to Reaction Web Knee Braces. Love this support brace. Fits perfect. I tore every ligament and cracked the tibia plateau. Once the bones healed I still had a bit shifting going on and MCL ligament felt weak. As soon as I put this support on I felt secure stable, and safe to walk. Now back to a slow run. DonJoy has the best braces out there. While healing I tried many. And DonJoy through the stages are the best. No doubt. Use the fit chart properly and you can't go wrong. Pros: Stays up, has a special style fit that forms to your leg. Especially for those who have muscle form. Not cheap or flimsy. Helps with strengthening. NO bulking or twisting. The fit chart is the key. They were out of the color I wanted, they gave me option on another color and delivered to my surprise over night. Cons: If the pocket was sewn in a different position would be nice. Maybe more at side instead of back, where hard to get to. And sewn up and down instead of side to side. But the fit is secure enough I just place keys or what have you under brace in front. I have OA right knee. Struggled for daily compression support. Many $$ spent with failed expectations. Reluctantly, I purchased a expensive brace. Not being let down I'm very pleased with my Donjoy brace. I will suggest shaving your leg with #1 blade as it reduces slippage tremendously. Also the sweating is absorbed. The material lives up to expressed standard. Highly recommend in fact I will purchase again. The Tri-Zone sleeve was exactly what I thought it would be. Pros: I like the design and the initial fit. Cons: However, I thought the design covered BOTH sides of the knee. I hurt the medial side on my right knee. The strapping design is on the lateral side of my right knee...not exactly covering my injury. Lastly, the size did not fit, so the sleeve slips.